With the number of telecom companies shrinking, it is clear that communications is much bigger than telecom - Communication Services includes any content delivered on networks. The old Telecommunications Sector was vanishing because it was missing new and popular ways people communicate now. Communication is essential in a modern economy. Without it, the economy would be a series of small isolated villages each trying to be self-sufficient. With it, information is shared, companies specialize, and trade flourishes. The content of communications used to be spread across different industries and delivery networks. Today, interconnected networks deliver virtually any content to any device over any network: text, voice, and video via wired, wireless or the internet, television via broadband, newspapers read via smartphones, movies via streaming while social interactions and media follow people everywhere. Content is crucial for commerce, business, finance, securities trading, and people. The development that created communication services is the interconnection and sharing of content on networks. Many communication services companies are young. 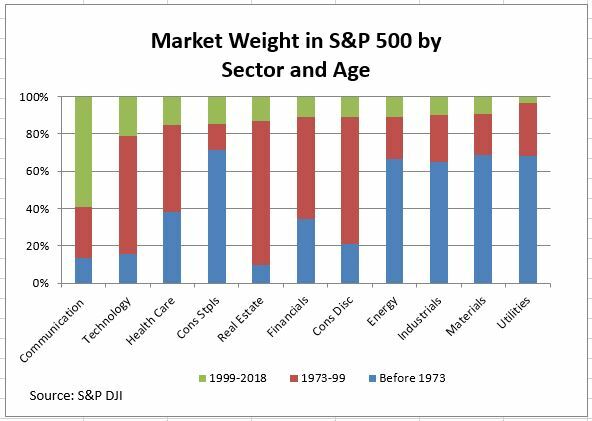 Using the dates when companies in the S&P 500 IPO'ed, we can get a sense of how old companies in various GICS sectors are. Companies have been grouped into those that became public before 1973, those listing between 1973 and 1999, and those that IPO'ed this century. Specific dates were not obtained for the pre-1973 group. Moreover, some mergers and corporate actions obscure the dates. For example, AT&T (NYSE:T) has a date of 1984; it was created as one of the "Baby Bells" when the original AT&T was broken up in 1984. The original AT&T was incorporated in 1877. The chart shows the proportion of companies in each sector by age group. Communication Services on the left-hand side has the largest green - young - bar of any sector. Utilities, at the right, is the oldest sector. Real Estate includes REITs. REITs were not listed on the markets in large numbers until the 1970s, explaining the large portion in "middle age." Communication Services is clearly the youngest sector due to social media giants like Alphabet (Google) (NASDAQ:GOOG) (NASDAQ:GOOGL) and Facebook (NASDAQ:FB). Technology is now the second youngest and dominates the 1973-1999 period when Microsoft (NASDAQ:MSFT) and Apple (NASDAQ:AAPL) came of age. Industrials, Materials, Energy, and Consumer Staples represent growth of the US economy during the first three-quarters of the last century. The relative youth of Communication Services can be a challenge for security analysts. About 60% of the market capitalization of the sector has less than 20 years of history with little data to track performance over market cycles or to reliably classify stocks by factor. 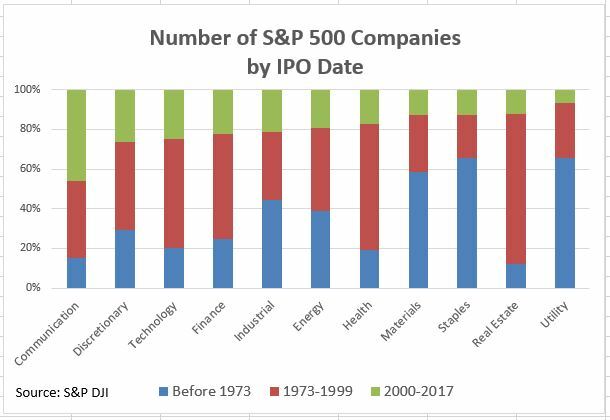 While some companies in the sector IPO'ed before 1973 and a few date back to the first half of the 20th century or earlier, the sector is still experiencing rapid changes. We take communications for granted, acting as though smartphones and the web always existed. However, today's communication networks weren't always here; they developed in R&D labs and garages as technology and the economy developed and matured. The table shows how the elements of today's communication networks moved from the laboratory to commercialization. The growth of interlinked networks bringing virtually all content together and delivering anything to anyone anywhere is changing the way we view the stock market and driving merger activity. Verizon (NYSE:VZ) and AT&T - the bulwark of the old Telecommunication Services Sector - own Yahoo and Time Warner. Comcast (NASDAQ:CMCSA) owns NBC-Universal while competing with AT&T and Verizon by selling phone service. Slightly over half of smartphones in the US operate with Android. Google and Facebook capture a quarter of global spending on advertising. Communication services are as important in the stock market as in the economy. To track these developments in networking and content, GICS is introducing the Communication Services Sector by combining networks and content from the Telecommunications, Information Technology, and Consumer Discretionary sectors. The old Telecommunication Services Sector disappears.